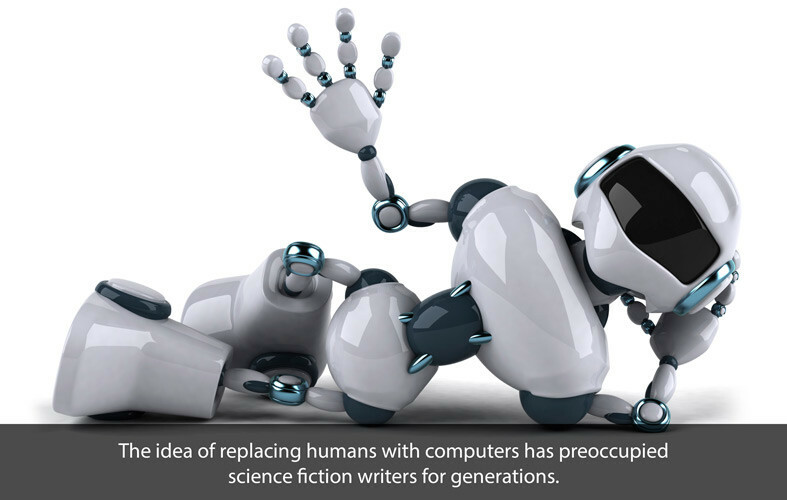 The idea of replacing humans with computers has preoccupied science fiction writers for generations. Indeed, when most people think about artificial intelligence, they first think about representations of artificial intelligence (AI) in Hollywood films, such as A Space Odyssey, Bladerunner or more recently, Her. Of course, in reality, AI is already present in our lives but in far less highly developed forms. In an earlier post, “Training for the Future,” we explored the impact that personal assistants, like Siri, are already having on how children and young adults interact with computers. In short, applications, like Siri, are preparing young people for a future world where computers will be ubiquitous, interfaces, such as keyboards, will all but disappear, and our technologies will become increasingly adept at anticipating and responding to our personal and intellectual needs. It follows then, that over the next fifty years, forms of AI will likely play an increasingly important role in training and education. But can AI ever replace human educators? Certain aspects of education and training will always entail the delivery of basic units of information. As AI becomes increasingly reliable and responsive, there is no doubt that it will increasingly be utilized to convey information (e.g., facts, foundational knowledges, procedures and skill sets). However, for higher-level learning (e.g., the application of information in context), AI will remain limited. After all, teaching students to apply information in context requires intuition, creativity and judgment, which are human skills acquired through experience. Since the 1960s, educators have been experimenting with ways to utilize computers in evaluation. Take, for example, the Autotutor, which was rolled out at the 1964 World’s Fair. The Autotutor was just one of the many early attempts to use computers to impart knowledge and test students’ progress. Over the past fifty years, the use of computers in evaluation has continued to evolve, but will future educators be able to fully hand over their evaluation work to computers? While basic facts or procedures can be effectively evaluated without humans, evaluating more qualitative knowledges will likely continue to surpass AI, even as AI becomes increasingly sophisticated. Some of the earliest experiments in AI focused on the development of language learning and translation programs. However, as anyone who has attempted to use a computer translation program knows, these programs remain highly flawed. Most language learning apps are just as limited. For this reason, it seems unlikely that computers will fully replace language teachers, interpreters or translators any time soon. After all, fluency in a language requires more than an extensive vocabulary and thorough knowledge of a language’s grammatical rules. Fluency is contingent on a deep understanding of a language’s cultural context. To be fully fluent, one also needs to possess the ability to interpret a speaker’s tone and paralinguistic cues, which may vary considerably from culture to culture. Until Siri and Siri’s counterparts can begin to fully interpret our words in relation to our tone and body language, it seems unlikely that AI will fully replace human language teachers or human interpreters and translators. Critical thinking typically refers to the process of conceptualizing, applying, analyzing and evaluating information. Critical thinking is not about acquiring information on a single subject. Critical thinking transcends subject matter divisions. Some educational theorists maintain that critical thinking is where logic, ethics and judgment intersect. So, can AI help us become critical thinkers? Critical thinking can be enhanced by the ability to access and compare large amounts of knowledge quickly. Since AI enhances this task, it may support critical thinking, but will AI ever be able to demonstrate what critical thinking looks like? To the extent that critical thinking is about judgment and ethics, AI will likely remain limited in this capacity. Finally and most importantly, great educators are people who inspire students. They are people who lead by example. Indeed, while students may consider educators’ personal anecdotes little more than tangents, these personal stories are typically part of the package of what makes a great educator. While AI may be able to deliver information and in some instances, even test students more frequently and accurately that a human educator, AI’s potential to inspire students will likely remain limited. After all, beyond the fact that we are still far away from developing a form of AI with a believable level of emotional intelligence (empathy is also an important part of teaching), AI has no history, and one’s personal history is often what makes an educator most impactful in the classroom. So should educators be worried about AI? While future students will increasingly learn from forms of AI, human educators will continue to lead, mentor and inspire students. In other words, AI is more likely to replace our future teaching assistants than our future teachers.